Yes, today is my birthday and this is my 100th post! Which makes me wonder two things...#1 how did I get so old? and #2 how did it take me so long to reach 100 posts. But in honor of my birthday (and 100th post) I wanted to give a present (since I got such awesome ones), so I decided to give away one of my most recent springy charts, your choice. #1 Spring ABC's by Lizzie Kate #2 Peep also by Lizzie Kate or #3 Are you my Mother? by Bent Creek. So leave a comment and I will pick a winner on April 1st. For my birthday I went on a little shopping spree this morning at my LNS. I was missing a bunch of threads I needed for all my crazy January challenge projects. And the sweetest part is boyfriend said the spree got to be one of my surprise b-day presents. He also took the day off work to spend the afternoon with me digging our new sunflower garden out back, and arrived home last night with a gorgeous strawberry cheesecake from Cheesecake Factory, so I have been well spoiled for my birthday. My big present though I got two weeks ago, which was tickets to go see the musical "Wicked", it was amazing. And for the first time I got to sit on the ground floor of our local auditorium. I have seen other shows there, but always from the cheaper 2nd or even 3rd floor balconies. Now I don't know if I can go back to the cheap seats. It was such a great show, and a wonderful date night for us. Ok, so enough gushing about sweet boyfriend and back to x-stitch. The above little pillow was just finished this week. 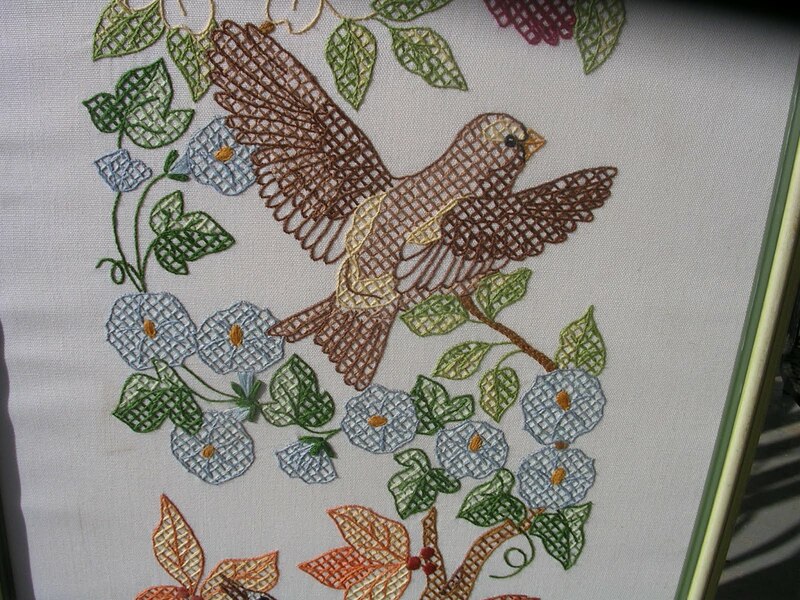 It is out of Cross-Stitch and Needlework magazine from May 2009. I picked up the magazine at our local book sale they have at the fairgrounds every February. I go every year, and it is so exciting finding old crafty magazines and books for a dollar each. I always go home with bags full of books. I hope everyone is as happy as I am on my birthday, and has a wonderful weekend ahead. 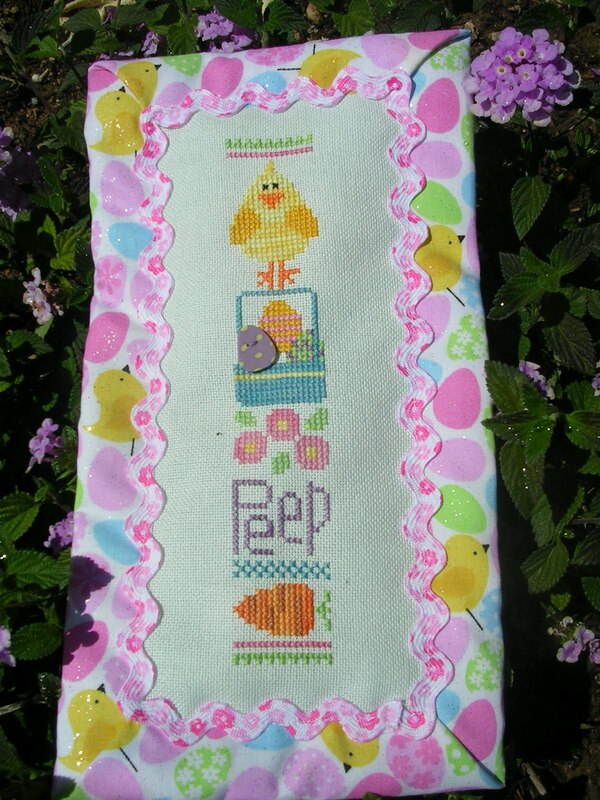 So this is another Lizzie Kate, "Peep", finished for my spring shelf. Is it weird how much pleasure it gave me to see it was a limited edition chart, and I have #1113 out of like 1400. I normally don't buy kits, but this one was so cute, and quick to stitch. This border fabric I found at Jo-Anns for 40% off already for Easter sales. And the ric-rack came from Hobby Lobby (which normally is not my first choice for sewing stuff, but they do have a nice selection of ribbons and trim). And another shot of our neighborhood wildlife. Yesterday afternoon there were 6 of them perched on top of our tame ones cage. Of course by the time I fumbled my camera out they took off. I think some of them must have started out tame and were escapees. It is amazing how close a few of them will let me get. Hope everyone has a great weekend ahead. 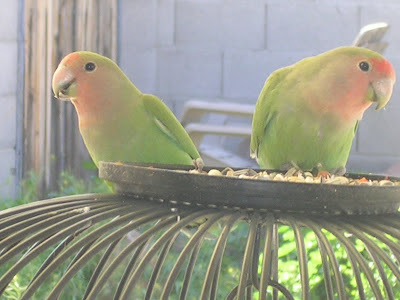 I will be trying to get my spring garden in the ground, before it reaches 100 degrees and boiling here in Arizona. So when all else fails my answer is to ask/plead/beg with my mom. 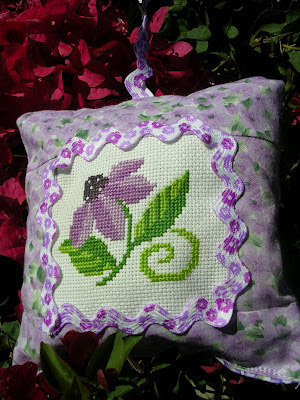 I was so frustrated with trying to sew on the eyelet trim to this little pillow, that I finally stuffed it all in a ziploc bag and said "FORGET IT!". I then turned my ziploc bag of failure over to my mother. Bless her, she didn't laugh when she had to rip out multiple rows of tangled thread. Nor did she question why I was using red bobbin thread with white top thread (sheer laziness). My mom is of the generation where sewing was a necessity and not just a hobby to learn. Sewing to her is a skill for mending/making things, not just for creativity. So this, what was a mountain of impossible for me, was simple as pie for her. Thanks MOM! And this is my spring shelf. 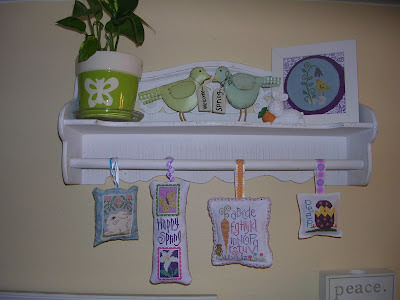 I mentioned it a few posts back, how I wanted to fill the towel bar with ornaments. 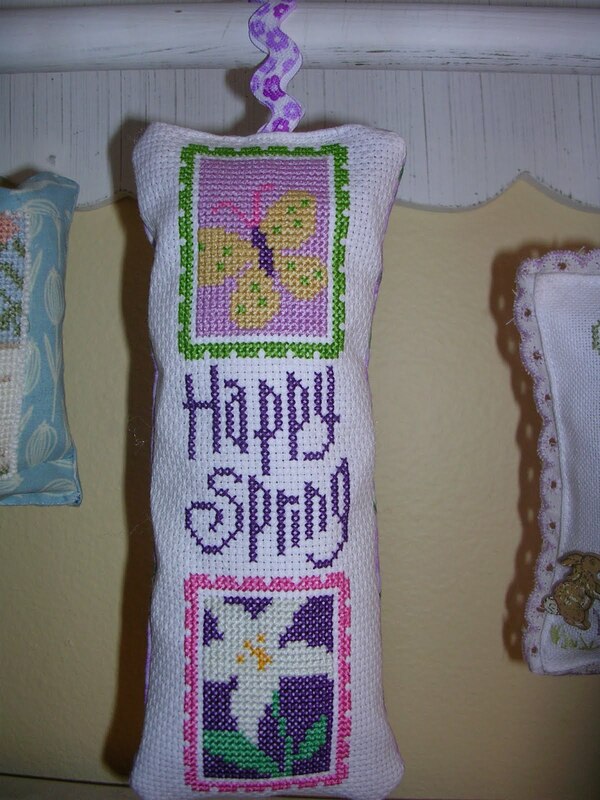 And I have, just in time for spring, with a little help from mom of course. 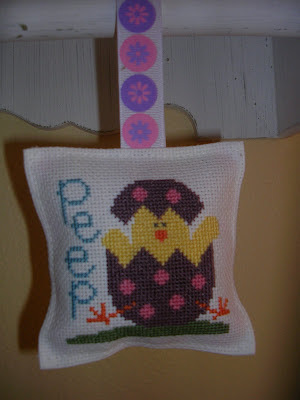 This is the only one of my spring ornaments finished by my own hand. Prairie Schooler, I think the name of the chart is "Bunnies & Chicks". 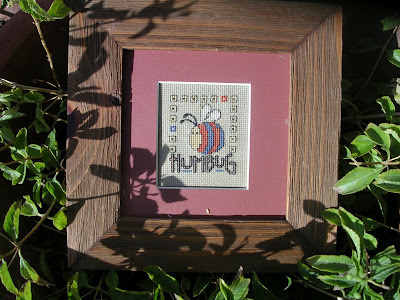 I outlined the border of it with little white seed beads. This has been hiding in my "done but not done" box since 2 springs ago, so I am glad to have it out and displayed for this year. 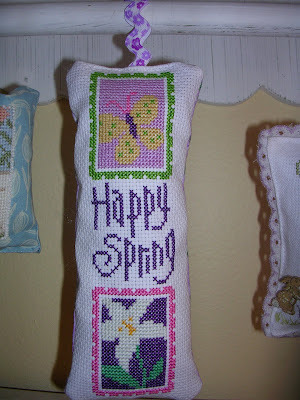 Lizzie Kate "Happy Spring". 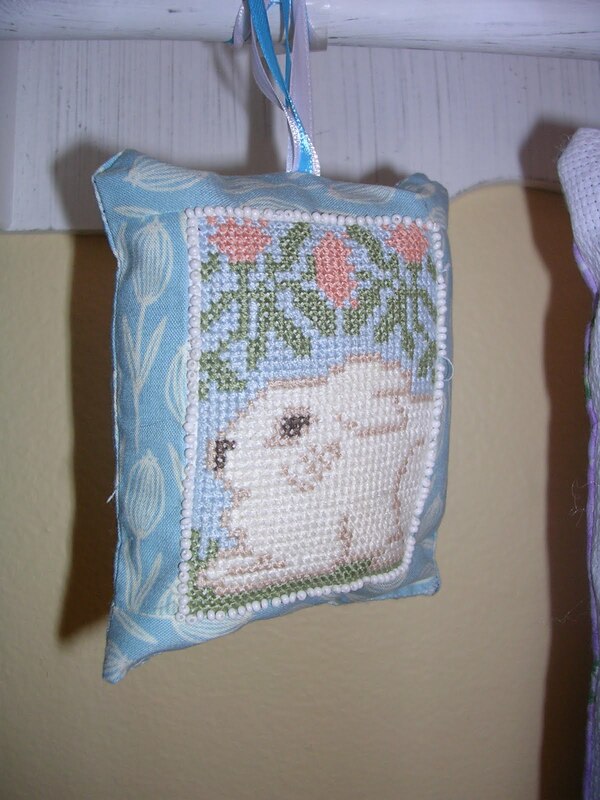 I love her smaller patterns for ornaments. I have Spring Crazy and the Fall Crazy charts. 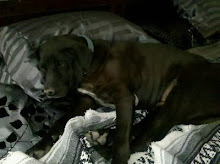 Below is also a Lizzie Kate. And this is Bent Creek "Are you my Mother?". 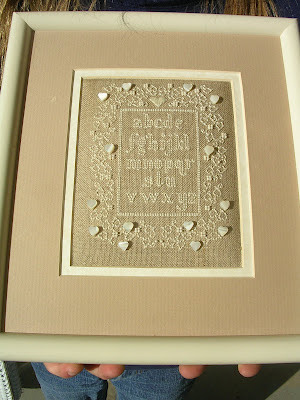 The circle mat around it was custom made by me with some scrap booking papers and a very sharp craft knife. I laugh at the frame. 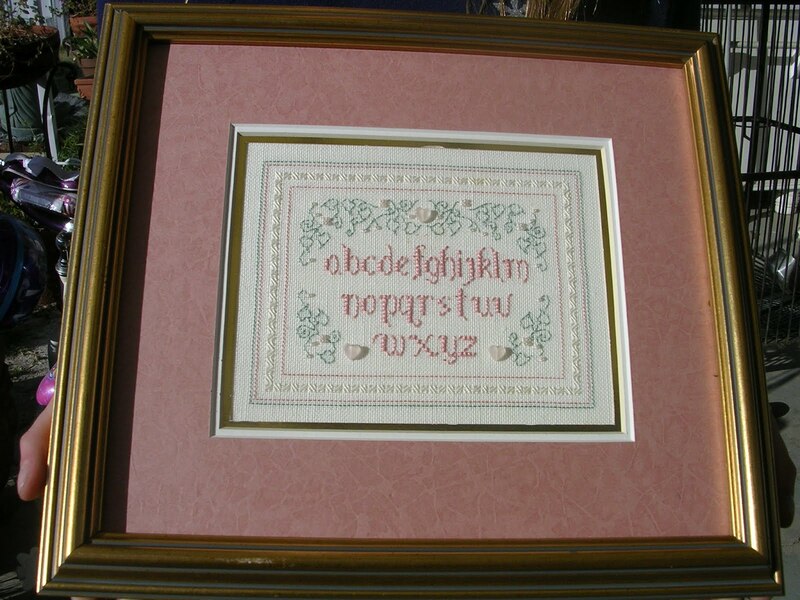 After my last post bragging about how I find such cute frames at Goodwill I bought this one for $1.50 at Goodwill thinking how hard it is to find square frames. So I get it home and turn it over to pop the back off of it, only to find an orange clearance sticker on the back saying it was sold for .99 cents at IKEA. I'm counting the .50 cent mark up as the gas I saved from not driving to IKEA. 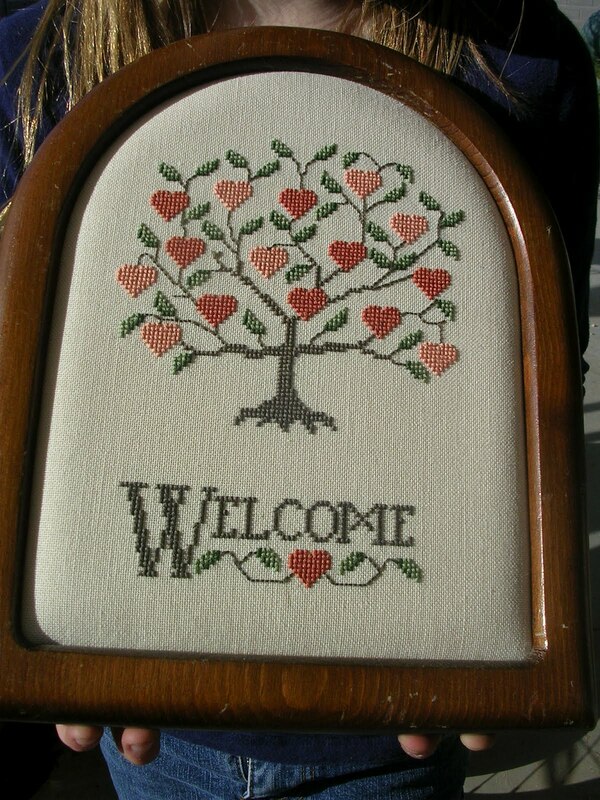 So if you have read my blog for a while now, you may know I often shop for my frames at Goodwill and other assorted thrift/consignment stores. I love finding something unique for a good deal (ok I admit I really really like the thrill of finding a good deal). And I have found some pretty cool frames there. 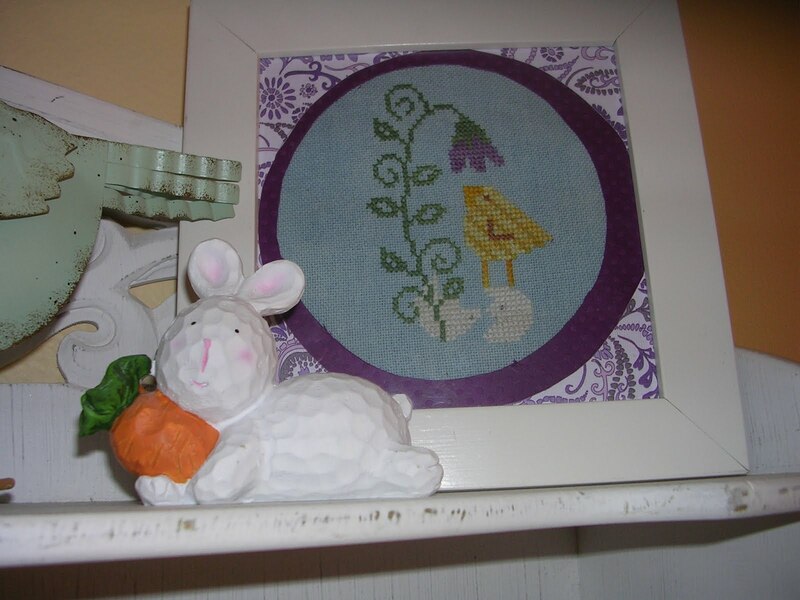 But also while browsing I normally find at least one piece of stitchery among the assorted "artwork". And I always feel a little sad to see someone's hard work and time and love donated away. Especially the ones that have some loving inscription on the back. 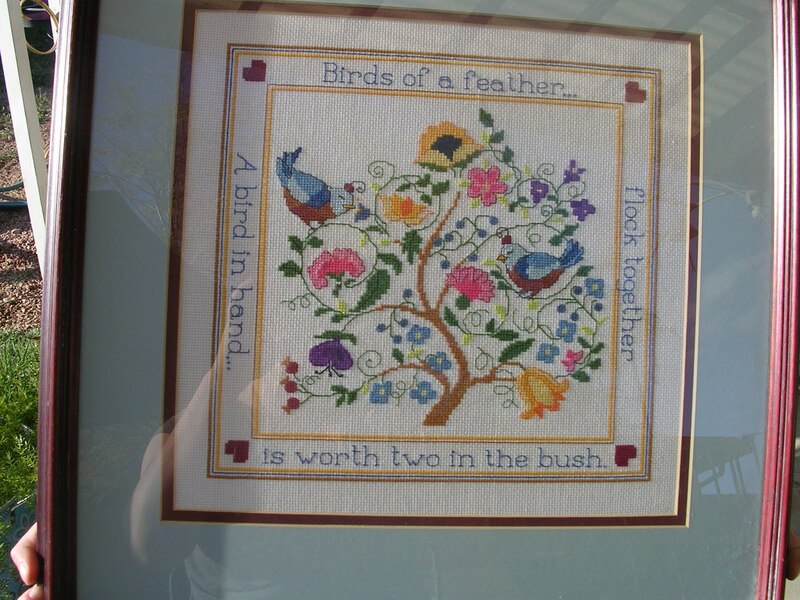 I try and restrict myself from buying ones I wouldn't actually hang in my home (strangers birth sampler from 1982--yes those ones). 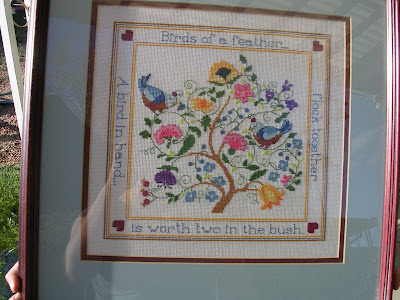 But anything else is fair game, and I have actually found alot of ones I would have stitched myself, recent designs from designers I have even heard of. So here is my tour de Goodwill. None of these have been stitched by me, but all have found a place in my home. The one on top is a Bent Creek design, done in 2000 for someone named Kris. Very nice frame and matting, as are most of the ones I discover. 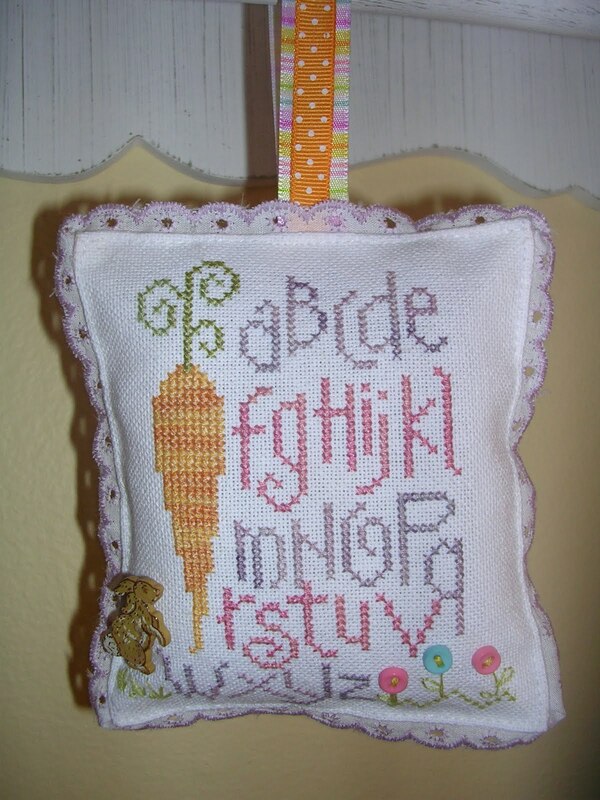 This one I am not sure you would call it cross stitch, maybe more embroidery. It's done on a cloth like material, but isn't stamped. The stitches are HUGE. The centers of the flowers are all french knots, dozens and dozens of tiny french knots. 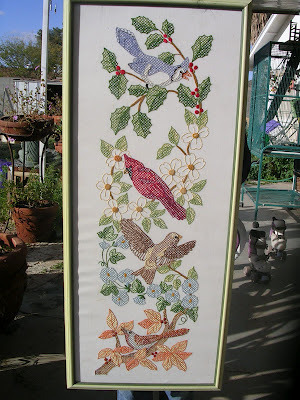 This piece measures about 3 feet tall, and I love that it has a bird for each season. No inscription on the back of this one. This one was done in 1987 for "Grandma and Grandpa from Sandy". No idea who the designer was, but love the pinks of it. This one is obviously a Shepherd's Bush design, I love the light green frame with it. Another huge one, professionally framed and matted. This one is about 2ftx 2ft. The colors are a little dated, but bright and cheery none the less. These two are I think Sweetheart Tree? 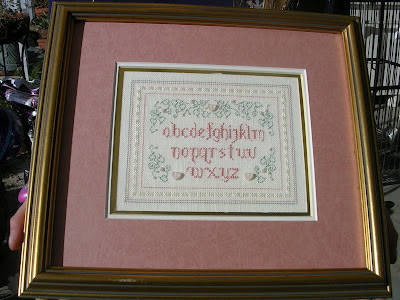 Very intricate stitching and beading, and beautiful frames on both. 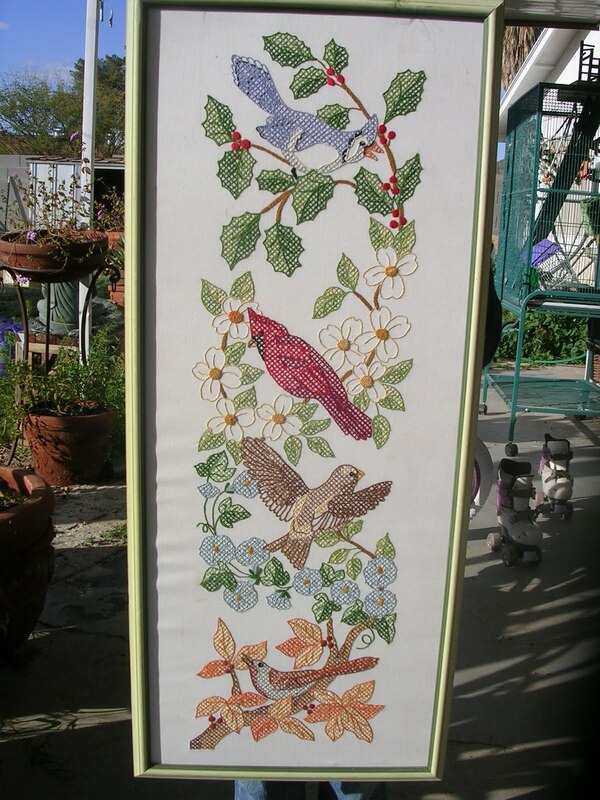 I definitely would have stitched these ones myself if I had seen them finished. Some designs are just "Meh" when you see the chart, but once you see them stitched they are "wows". That's how this designer is for me. 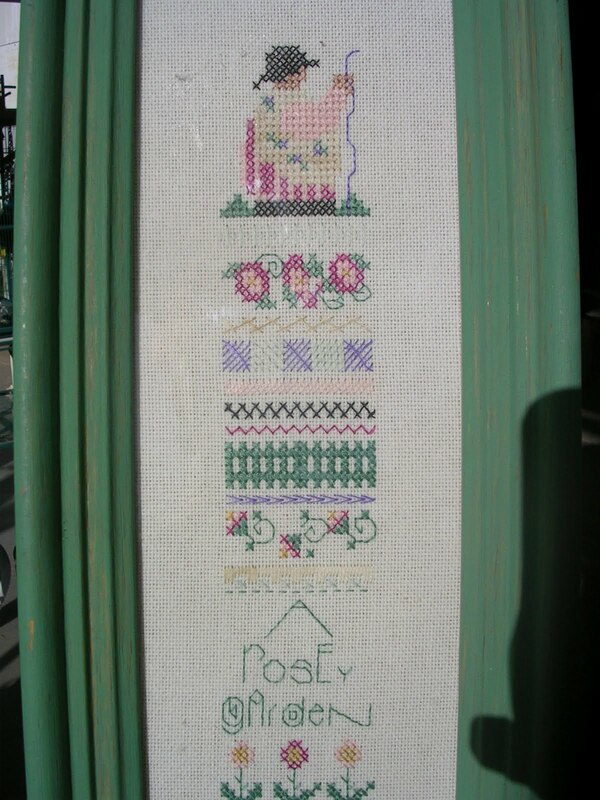 And this last one was stitched in 1988. It is about two 2 1/2 feet wide. 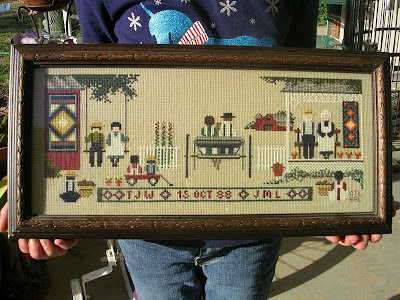 Thanks to my assistant my oldest daughter for so patiently holding up all my "found" cross stitch. Hopefully if I raise her with a love of crafting none of my stuff will ever see the inside of Goodwill.